On the morning of February 28, the municipal committee of Kunshan city and the municipal government convened the conference to accelerate the innovation transformation and promote the high-quality development for whole city. 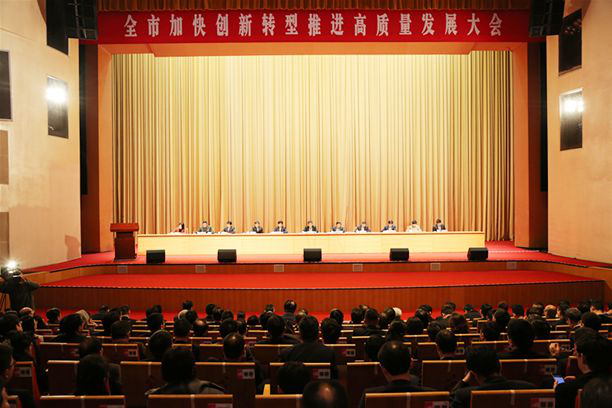 The conference has thoroughly studied and applied the party's 19th conference spirit .take the new era of socialism with Chinese characteristics from Xi Jinping as guidance, earnestly implement the important instructions for the work of Jiangsu requirements from Xi Jinping, to insist a systematic thinking, pay attention to regularity, further unified thought, raise awareness, boost confidence, to speed up the pace of innovation transformation, go all out to promote high quality development, make Kunshan forefront of “two benchmark ” build a well-off society in an all-round high level, to realize the basic modernization construction on a new journey from a high starting point, to be "strong &rich &beauty& high" as the first army to lay a solid foundation for the construction of new Jiangsu vanguard. The secretary Du Xiao gang stressed that high-quality development is a big test of the new era. Based on the new historical position and time coordinates, the whole city needs to raise awareness and seize the historic opportunity of high-quality development, To deep understand that the development of high quality is the main stream of the development of economy, is the hope of hearts and minds of social development, is a technological change trend, is the key to watch well "Kunshan road". The commendation for "2016 ~ 2017) Kunshan innovation to speed up the transformation of promote the development of high quality advanced enterprise" has shown on the Conference, SAFERUN machinery (Suzhou) co., LTD was awarded "strategic emerging industry enterprises" and "ecological environment friendly enterprise". SAFERUN sticks to the path of value innovation and innovation. SAFERUN sticks to the business direction and product features are based on the major technology breakthrough and development demand of the strategic direction of industrial development and highly fit, SAFERUN is will get the best historical development opportunity. SAFERUN will strengthen the industry with unswerving strategic determination and get out of a path of high quality development with characteristics. With a sense of urgency to accelerate the transformation and upgrading, to show a great splendor in the new era; Vitality to speed up the innovation and development to take the lead in economic environment and focus on the new technologies, new industries and new model and new formats on speakers, to be a pioneers in digital, networked, intelligent, environmental.